Mother of 12: Henry, Emma B. (George J. Klein), Minnie (Maurice J. Howe), Amanda (Herman Graves), Alvina M., John C. (Blanche Apking), William C. (Gertrude M. Adolph), Cynthia, Talitha (William Becker), twins Amelia & Malinda, and Evaline. The departed, Mrs. Eva Friederica Maria Dorothea Hack, nee Ruge, daughter of Charles and Wilhelmina Rufe nee Zirzow, was born, June 24, 1860, at West Chicago in DuPage Co. Being the child of Christian parents, she was in early infancy placed in the arms of her Saviour through baptism in a Lutheran church at Downers Grove. 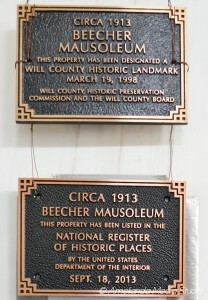 When she was about five years old her parents moved to a farm, west of Goodenow, residing there two years, after which they established the so-called Ruge homestead, five miles south-east of here. Her parents having united with the St. John’s congregation gave the departed every opportunity to gain a thorough religious education so that, March 29, 1874, in the hour of her confirmation and in the presence of her pastor, Rev. Keuchen, and a large congregation she could gladly and gratefully promise allegiance to her Master. 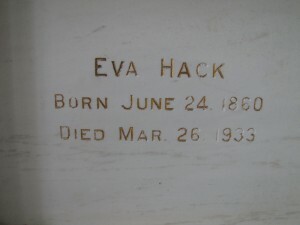 On Sept. 28, 1876, she was united in marriage with Herman Hack, Rev. Keuchen officiating. This happy union was blessed with twelve children, of whom three – Henry, Cynthia and William, preceded the mother in death. The surviving children, who deeply mourn the departure of a loving mother, are: Emma, Mrs. George Klein, Chicago; Minnie, Mrs. Mauirce Howe, Chicago, Amanda, Mrs. Herman Graves, of Crown Point; Alvina; John of Peotone; Talitha, Mrs. William Becker, Peotone; and Amelia, Malinda and Evaline. May also be mentioned here that one grandchild, Mamie Graves, fully shared in a mother’s love with these children. Immediately after marriage the young couple engaged in farming on the Hack homestead, southeast of town. After thirteen years on this farm they moved to Cissna Park, where for four years they followed the same occupation. Returning to Beecher they lived for one year on the so-called Many farm, after which they re-settled on the old homestead. 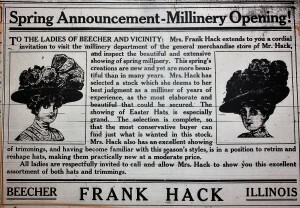 In 1912 they gave up farming and came to Beecher where Mr. Hack until Jan. 1, 1923 acquired and successfully conducted his brother Frank’s store. On Feb. 19, 1926, he was quite unexpectedly called to his eternal reward. Following the death of her husband, the departed continued to live in her home on Indiana Street where her daughter, Malinda, and her granddaughter, Mamie Graves, made her life as pleasant and comfortable as they possibly could. Having failed in health for some time but without due cause for alarm it came as a distinct shock to her loved ones and the community when, Thursday morning, March 23, a paralytic stroke brought her to the very door of death. A doctor and the children being immediately summoned, it soon became apparent that medical skill and loving care on the part of the daughters, her daughter-in-law, Mrs. Gertrude Hack, and Miss Verna Adolph would prove of no avail. Thus, Sunday morning, March 26, at 8:06, she peacefully closed her eyes in death at the age of 72 years, 8 months and 2 days. Those deeply mourning her passing are the children already mentioned, three brothers and Emil of Lowell, Indiana; one sister, Alvina, Mrs. Otto Knuth of Chicago; two daughters-in-law; twenty-six grandchildren; six great-grandchildren and a large number of other relatives and friends. Funeral services were conducted, Wed. March 29, at 1:30 p.m., at the house, Rev. Horst officiating and Mrs. Adkins rendering a solo. Services were conducted at St. Luke’s Church, where her pastor spoke the German and English languages to a very large attendance. In addition, the Ladies Aid of which Mrs. Hack had been an active member, sang two appropriate songs. Mrs. Adkins also sang two heart-touching solos. Rev. Thomas Adkins, Crown Point, Ind., pastor of Mrs. Graves, who was too ill to attend her mother’s funeral, offered a consoling prayer. Many beautiful floral pieces gave ample evidence of the esteem in which the departed was held by all who knew her. She was buried in the mausoleum. The pallbearers were: Arthur Hack, Arthur Ruge, Dr. E.C. Hack, Wesley Ruge, Leslie Schultz, Irwin Loitz, Wm. Meyer and Otto Meyer. The grandchildren served as flower carriers. This entry was posted in Automated Burial Listing, HEADSTONE, Ladies Aid Society, Obituaries- Have Full Copy, St. John UCC, South Beecher, St. Luke's UCC - Beecher by Sandra. Bookmark the permalink.